The Watercolor Wings is flying away and retiring. The stamp set has been around for quite a while now and I’m really finding it hard to say goodbye! Over the years I have used the Watercolor Wings a lot and it’s definitely “earned it’s keep” in my stamp room. Now it is time for it to fly away. I love the BIG BOLD images of these butterflies. If you love it too and have not purchased it yet, do so ASAP before you can no longer get it. 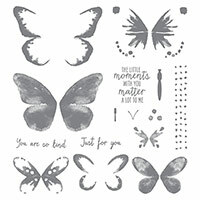 The watercolor wings stamp set retires on May 31st, but as of May 25th it will only be around until it sells out, which may be sooner than May 31st!!! Here are a couple of cards I found while cleaning out my office. A lot of the products are now retired, but these cards show how wonderful the stamp set is. You could recreate these cards using other papers, ribbons, colors, and such! If you’d like to grab this set before it flies away, just click on the picture below to go to the online store and order. CLICK HERE to see what is on sale and what is retiring!!! Don’t delay–things are selling out fast! Are you looking to purchase Stampin’ Up! products? I would be honored and would truly appreciate you selecting me to be your Stampin’ Up! demonstrator and place your order through me. When you do, you will become a VIP STAMPER with me. My VIPs enjoy lots of monthly tutorials for projects shared ONLY with them, monthly specials/discounts, and are the first to get all new catalogs. I have been a full-time demonstrator for over 23 years and am here to help you with all your stamping needs. My motto: STAMPING MADE SIMPLE- that is what I love to teach you to do! The brand new 2018-2019 Annual Stampin’ Up! catalog is coming soon!!! My customers who have placed at least a $50 order through me since June 2017 will automatically receive a catalog. You do not need to request it! You should receive your free catalog around the middle of May; it’s my gift to you for being a valued VIP STAMPER!